Castel del Monte is the best known of the many castles built by Holy Roman Emperor Frederick II of Hohenstaufen. 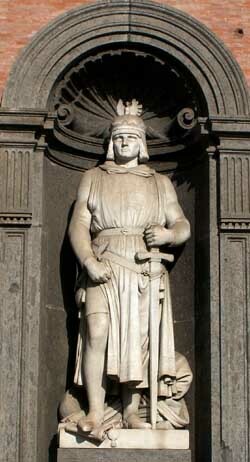 Frederick was responsible for fortifying the Adriatic coast against Saracen incursion, a project he started in 1223 in Foggia after returning to the kingdom of Sicily from a stay in Germany. (Note that Frederick was shoring up the northern coastal reaches of his kingdom of Sicily; thus, not only the Adriatic, but the Ionian coast—i.e., the “sole” of the boot—and the Tyrrhenean coast as far north as Naples were built up, as well). In Puglia he built from scratch or rebuilt fortresses on the Gargano spur (most important of which is the castle at Monte Sant’Angelo) and in Lucera, Melfi, Bari, Barletta, Gioia del Colle and many other locations. Some of these were on sites fortified earlier by the Norman founders of the kingdom of Sicily. All in all, counting the island of Sicily, Calabria and Puglia, Frederick built or rebuilt about two dozen fortresses during his reign. 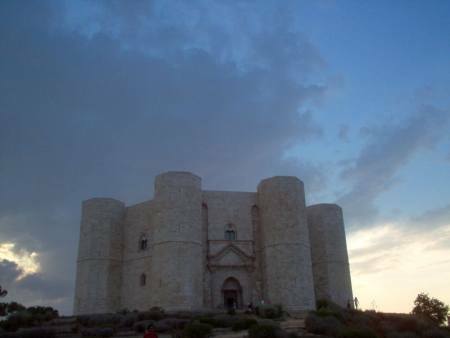 The Castel del Monte is located inland from Andria, near Bari, on a prominent height of the western Murge (a local geographical designation) in Puglia. The complete name of the site is Santa Maria del Monte, named for an earlier church (which no longer exists) on or near the site. The Castle del Monte was started around 1240 and finished in 1249. It apparently was not intended to be a true fortress; at least there are no typical defensive structures such as a moat, drawbridge or underground passageways that would indicate such. Frederick may have simply wanted it as a residence and hunting/falconry lodge (although those who read magic and symbolism into the architecture—see below—resist that prosaic view). The walls of both outer and inner perimeters, however, are substantial—each about 2.50 meters thick. There is some evidence that the castle was built on the site of an earlier Norman fortress. In any event, its location on a height near the ancient Roman via Trajana, which leads from Benevento to Brindisi, filled a gap in the extensive chain of castles and forts built by Frederick. The architecture is among the first examples of the Gothic style in Puglia. It is, however, a special Gothic. The entire structure is octagonal. There are eight towers, and there are eight rooms each on both floors. The internal courtyard is also an octagon. There is a splendid arched portal as an entrance and there are windows between all towers, one window for the upper floor and one for the lower. Mola, Stefania. (2002) Castel del Monte, n. 4 in the series Puglia in Tasca. Mario Adda editore, Bari. ISBN 88-8082-465-1, which contains an extensive bibliography.